Publisher: Cambridge University Press, 1960. Hard Cover, 280 pages, 6.5 x 9.5. 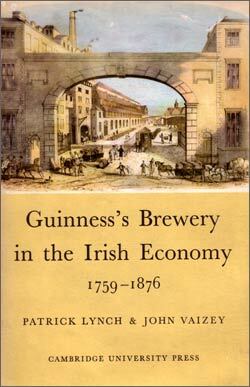 Here is a hard-to-find history of the Guinness Brewery's early years, published by Cambridge University Press in 1960. From the dust jacket: "Against the background of Irish economic and social life, this book gives the history of the great Irish brewery from 1759, when Arthur Guinness first bought it, to 1876, when his great-grandson Edward Guinness (Lord Iveagh) took sole control. The authors survey the conditions in which the firm originated, and the influence of political and economic change on its rise to a leading position in England and a dominating one in Ireland." Includes several illustrations, as well as a foldout aerial view of the brewery from 1939, and a foldout Guinness family tree.